Ports Thoughts: He shoots, he scores! While I was all caught in in the joy of my new site logo, I forgot to mention, Ali and I are having a baby :-) As befits any spawn of mine, it is due on the 1st of April. Perfect. Ali and I are chuffed to bits. We have been thinking of names but it is a bit hard because we don't know what flavour it is yet. We are currently using Herbert. Here is a picture of the little fella. Just to show any of you comedians that he hasn't got a beard yet. It's funny but the one thing that no one ever seems to complain about is the weeks when you know t'wife is "with child" but you can't tell anyone. More to the point you have to lie all the time to try and cover up. The rest of our Pub Quiz team thought that I had murdered Ali because of the increasingly lame excuses I was coming out with for her non appearance. And Ali's friends at her running club were getting increasingly concerned as she kept on feigning back ache to get out of exercises. What a relief it is now public! Congratulations to you both. You'll wonder what you did with your time before hand. You'll also wonder how you coped without the fulfilment and joy they bring. I wish Mrs P all the best during her pregnancy. Fantastic news, nice one Ports. As Alan P would say "back of the net". A new generation of Porters to take on Outlook and Exchange 2035. Now you'll be really glad that you've stopped smoking. Congrats Mr. and Mrs. P.
A Herbert to go with our Percy. One hell of an April fool!-what lengths you go to to impress!! Ali- I couldn't have survived my pregnancy without rich tea biscuits- for those moments when you have to eat NOW. If you thought that you got a lot of well meaning advice when you got married,JUST WAIT!! Fantastic to all three of you! Baby sitter at the ready! Ahhhhh! Ali and P are having a baby! and i shall be Aunty Niki and Jonathan has a little cousin. Well I never...at last I can tell people! I bet you all thought Ali was back on the Jaffa Cakes when really she had a bun in the oven all along. Only 2 cousins so far,and both called Jonathan! !Keeps it simple. Well I'll be a monkey's uncle ... or more precisely I'll be Herbert's aunt! Just when I have one of the little blighters trained up to be a pretty decent nephew I have to start all over again! Hope it all goes really well ... take care Ali! Hey, beards come later. I should know! Congrats to you both, good luck. 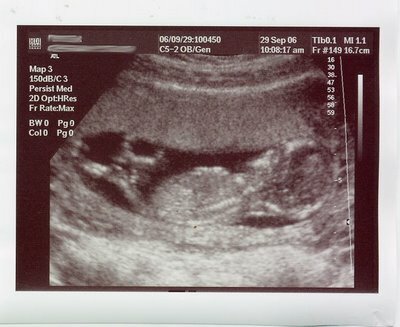 Looks like a boy to me, online sweepstake for gender and weight? Well, I never ! I haven't been to your blog for over a week or so, and now everything's changed !